On the last track we discussed conversation topics and internal decision making. Regarding conversation topics, we looked at basing initial topics on needs and secondary topics. This track also provided several techniques you can implement with your client to foster productive internal decision making skills. On this track we will discuss control over switching. As your DID client progresses through treatment, he or she may seem to acquire an increased ability to control the switching process. Conversely, as you know, untreated DID clients seem to be at the mercy of environmental triggers regarding switching. After time and practice in treatment, Alan found switching into and out of specific alters became easier and more under his control. You may find that as control over the switch process improves, many of the impulsive pathological behaviors decrease correspondingly. Putnam’s experience reveals two ways to help your client gain control over switching are overcoming host fears and facilitation of the switching process. First, let’s discuss host fears. As you know, among the early impediments or obstacles to increased control over switching are the host’s frequent attempts to suppress his or her alter personalities. In Alan’s case, he was initially unwilling and later reluctant to allow other alters ‘out’ either in therapy or in other settings. This suppression is almost always incomplete and provokes acting-out by the alter personalities. Later I found that Alan had been afraid that he would never be able to come back if another alter emerged. Alan stated, "Before I started treatment I didn’t really know anything about how dissociative identity disorder worked. When the others take over, it feels like I’m just fading away to nothingness. I was always worried that I might be pushed all the way down and never get to come back." Your Alan likely finds this void terrifying and dreads it with a phobic intensity. As mentioned on other tracks your Alan may also be concerned about inappropriate behavior by another alter. Based on Allen's past experience, this is probably a realistic fear. I felt Alan was concerned with rejection due to both an inappropriate and aggressive alter. Alan was both embarrassed by the switching process and resentful of the time that he lost to his other personalities. Time loss is an aversive experience for him. Alan often stated, "I’m always worried about what I might have done or said during the blank space!" You may also find that your client becomes concerned that you will come to like another personality better and consequently spend more time with the other personality. Would you agree that the host and other alters are all capable of an intense sibling-like rivalry for the affections of the therapist? If so, you might refer back to track 4 on promoting internal communication as a way to alleviate your clients fears. In addition to host fears, let’s examine facilitation of the switching process. 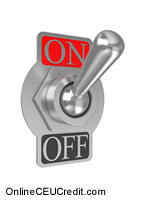 Clearly, increased control over switching is desirable because it gives the client more control over his or her life and enables you to examine the system of personalities more effectively for past traumas and current psychopathology. Control over the switching process is achieved gradually and has been described as the result of several factors. a. The first factor that affects control over switching is the host’s acceptance of the diagnosis and the host’s willingness to meet the other alters. b. The second factor regarding control over switching is improved communication within the system that allows for smoother and more appropriate switching. You can refer to the third, fourth, and fifth tracks on this CD set for information regarding improved internal communications. c. Let’s focus on the third factor affecting control over switching. I have found that an increasing internal trust develops among alter personalities as a result of better communication. As each of Alan’s alter personalities came to know one another better, they gained a greater willingness to share the body. As each alter’s needs became known to the system and a centralized decision making process began to acknowledge and meet these needs, Alan’s alters became correspondingly more willing to wait their fair turns and less likely to seize the body opportunistically to fulfill their own wishes. d. The fourth factor regarding control over switching is that improved communication also fills in the gaps in time, and alleviates fears about what may have happened. How can you set the stage for acquisition of improved control over switching? I have found that one way to foster improved control over switching is to allow the client to have some benign experiences with switching to help offset prior aversive experiences. Could hypnosis perhaps help your client regarding allowing other alters to step forward while the host watches from a comfortable position? With Alan, a second important intervention was to ensure that he returned after a switch to one or more alters occurring in therapy. Once, Alan failed to return during a session. Alan later told me, "I was alarmed when last time I came to, and I was no longer in your office! I didn’t know what to think and had no clue what happened!" Would you agree that it was also productive to inform Alan of what occurred during the portions of therapy in which he was amnesic? Clearly, as internal communication improves, you can delegate information sharing duties to the other alters. However, during early interventions, you may find it helpful to tell the host about what personalities emerged and what was said, so that he or she understands that therapeutic work is taking place in his or her mental absence. Perhaps your Alan often expresses concern over the outcome of therapeutic interventions with his alter personalities. Think of your Alan. Does he or she still experience a high level of anxiety regarding switching? On this track we discussed control over switching. Two ways to help your client gain control over switching are overcoming host fears and facilitation of the switching process. On the next track we will discuss transference. This track covered working with transference in multiples, principles of treating transference, and precipitants of transference reactions, as well as techniques for keeping the client straight and being real with the client. Control over the switching process is achieved gradually and has been described as the result of several factors. What are three of the processes? To select and enter your answer go to CEU Answer Booklet.